In-office Teeth Whitening: Procedure is done by your cosmetic dentist using a light or laser on professional grade gel with higher concentration of hydrogen peroxide or carbamide peroxide. For this popular power-whitening cosmetic dental treatment procedure, your dentist first protects your gums, and then applies a concentrated whitening agent. The oxidizing agent triggers the gel and produces instant results, almost in the range of one hour. Teeth bleaching can make teeth temporarily sensitive — or be uncomfortable for people who already have sensitive teeth. When used incorrectly, home kits can also lead to burned — even temporarily bleached — gums. 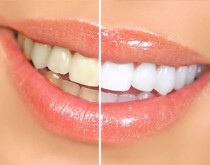 Teeth whitening works best for people with yellow teeth and is less effective for people with brown teeth. If your teeth are gray or purple, tooth bleaching probably won’t work at all. To be sure teeth whitening is worth your time and money, talk to your dentist before you use an over-the-counter tooth whitening kit.